In nature, materials such as ferroelastics and multiferroics can switch their microstructure in response to external stimuli, and this reconfiguration causes a simultaneous modulation of its material properties. Rapid prototyping technologies have enabled origami and kirigami-inspired architected materials to provide a means for designing shape-shifting structures, and here we show how multistable structures inspired by kirigami provide novel design criteria for preparing mechanical metamaterials with tunable properties. By changing the geometry of kirigami unit cells, we obtain multistable kirigami lattice structures endowed with a bistable snap-through mechanism. We demonstrate the precise control of material stiffness, along with the ability to tune this property in situ by locally and reversibly switching the unit cell configurations. We anticipate these mechanical metamaterials will provide a platform to achieve in situ tunable electrical, optical, and mechanical properties for a variety of applications in multifunctional materials, two-dimensional materials, and soft robotics. Thin elastic sheets bend easily and, if they are patterned with cuts, can deform in sophisticated ways. Here we show that carefully tuning the location and arrangement of cuts within thin sheets enables the design of mechanical actuators that scale down to atomically-thin 2D materials. We first show that by understanding the mechanics of a single, non-propagating crack in a sheet we can generate four fundamental forms of linear actuation: roll, pitch, yaw, and lift. Our analytical model shows that these deformations are only weakly dependent on thickness, which we confirm with experiments at centimeter scale objects and molecular dynamics simulations of graphene and MoS_2 nanoscale sheets. We show how the interactions between non-propagating cracks can enable either lift or rotation, and we use a combination of experiments, theory, continuum computational analysis, and molecular dynamics simulations to provide mechanistic insights into the geometric and topological design of kirigami actuators. Recent progress in advanced additive manufacturing techniques has stimulated the growth of the field of mechanical metamaterials. One area particular interest in this subject is the creation of auxetic material properties through elastic instability. This paper focuses on a novel methodology in the analysis of auxetic metamaterials through analogy with rigid link lattice systems. Our analytic methodology gives extremely good agreement with finite element simulations for both the onset of elastic instability and post-buckling behaviour including Poisson’s ratio. 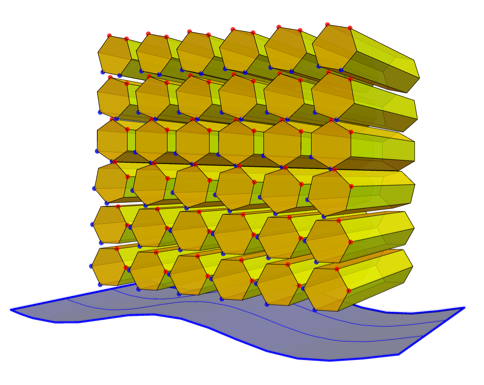 The insight into the relationships between mechanisms within lattices and their mechanical behaviour has the potential to guide the rational design of lattice based metamaterials. We present an analytical model to investigate the mechanics of 2-dimensional lattices composed of elastic beams of non-uniform cross-section.Our approach is based on reducing a lattice to a single beam subject to the action of a set of linear and torsional springs, thus allowing the problem to be solved through a transfer matrix method. We show a non-trivial region of design space that yields materials with short wavelength modes (closely associated with auxetic behaviour) for strains greater than that required to trigger elastic instability. The critical loading required to make this transition from long to short wavelength buckling modes is calculated. Furthermore, we present lattice parameters that provide direction-dependent deformation modes offering great tailorability of the mechanical properties of finite size lattices. Not only is our analytical formulation in good agreement with the finite element simulation results, but it provides an insight into the role of the interplay between structure and elastic instability, and gives an efficient methodology to pursue questions of rational design in the field of mechanical metamaterials. We calculate the effective long-term convective velocity and dispersive motion of an ellipsoidal Brownian particle in three dimensions when it is subjected to a constant external force. This long-term motion results as a “net” average behavior from the particle rotation and translation on short time scales. Accordingly, we apply a systematic multi-scale technique to derive the effective equations of motion valid on long times. We verify our theoretical results by comparing them to numerical simulations. When a microorganism begins swimming from rest in a Newtonian fluid such as water, it rapidly attains its steady-state swimming speed since changes in the velocity field spread quickly when the Reynolds number is small. However, swimming microorganisms are commonly found or studied in complex fluids. Because these fluids have long relaxation times, the time to attain the steady-state swimming speed can also be long. In this article we study the swimming startup problem in the simplest liquid crystalline fluid: a two-dimensional hexatic liquid crystal film. We study the dependence of startup time on anchoring strength and Ericksen number, which is the ratio of viscous to elastic stresses. For strong anchoring, the fluid flow starts up immediately but the liquid crystal field and swimming velocity attain their sinusoidal steady-state values after a time proportional to the relaxation time of the liquid crystal. When the Ericksen number is high, the behavior is the same as in the strong anchoring case for any anchoring strength. We also find that the startup time increases with the ratio of the rotational viscosity to the shear viscosity, and then ultimately saturates once the rotational viscosity is much greater than the shear viscosity. The equations for the equilibrium of a thin elastic ribbon are derived by adapting the classical theory of thin elastic rods. Previously established ribbon models are extended to handle geodesic curvature, natural out-of-plane curvature, and a variable width. Both the case of a finite width (Wunderlich’s model) and the limit of small width (Sadowksky’s model) are recovered. The ribbon is assumed to remain developable as it deforms, and the direction of the generatrices is used as an internal variable. Internal constraints expressing inextensibility are identified. The equilibrium of the ribbon is found to be governed by an equation of equilibrium for the internal variable involving its second-gradient, by the classical Kirchhoff equations for thin rods, and by specific, thin-rod-like constitutive laws; this extends the results of Starostin and van der Heijden (2007) to a general ribbon model. 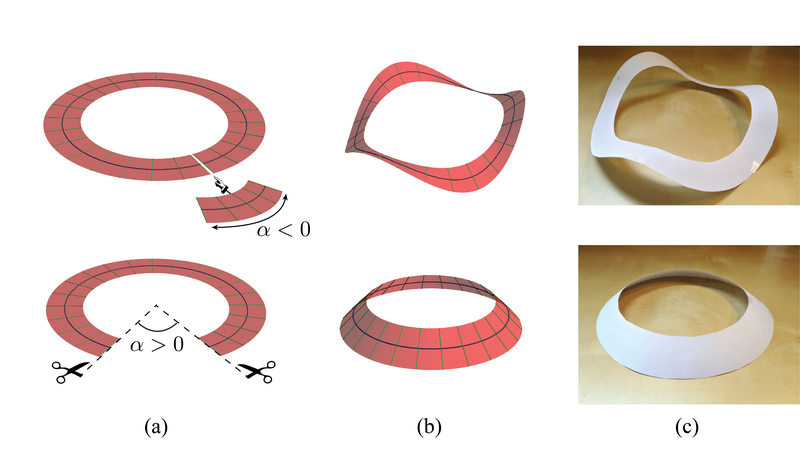 Our equations are applicable in particular to ribbons having geodesic curvature, such as an annulus cut out in a piece of paper. Other examples of application are discussed. By making use of a material frame rather than the Frénet-Serret’s frame, the present work unifies the description of thin ribbons and thin rods. M. A. Dias and B. Audoly, Journal of Elasticity (2014) Arxiv and Journal.